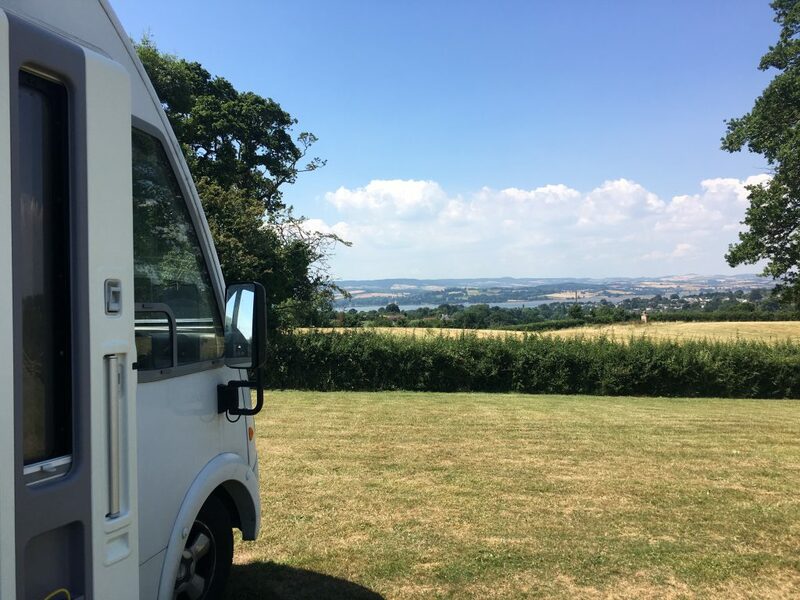 After our time in Taunton we picked up Bertie from storage and took the short drive to Exmouth, settling ourselves on a good value campsite with fantastic views across Lympstone and the Exe estuary. Exmouth was our home for 17 years and we were excited to be going back to see our friends in the town. In between all of the social activity we took the opportunity of the long dry spell to remove and re-seal our roof light. The leak from our roof has been a constant irritation since we got the van, but every time we’ve been somewhere appropriate to fix it the weather has been too wet. We have learned to park with our nose pointing slightly downhill so that water runs off of us rather than into us, but even so we sometimes find ourselves caught out. Usually the resulting drips end up in one of my trainers. Only one, and if I’m lucky I realise what’s happened before I put it on. Mostly I end up with a wet foot. After a quick chat to get permission from the campsite owner (who happened to work in the electrical industry so had plenty in common with Paul, including knowing a lot of the same people) Paul set to work. Removing the REMIstar roof light was a lot easier than envisaged. The internal trim came off easily once the screws were removed and the electrics were disconnected. 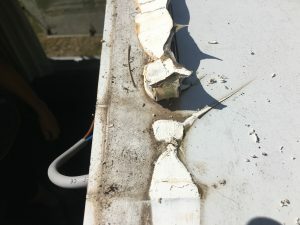 The main part of the unit was held on with two large screws and angle brackets and despite concerns that we might need brute force to prise it off, it lifted out with no problems, leaving sealant on the roof but none on the unit itself. I was getting ready to go out for lunch so played no part in the process apart from making encouraging noises every time Paul showed me something. It was definitely a one-man job, I’m sure I would have just been in the way. When the unit had been lifted off it was easy to see why we had a leak, the sealant was not one continuous line but must have been ‘blobbed’ on and there were three largish gaps along the front edge of the rooflight. Although it was highly frustrating to see the shoddy workmanship, it was pretty pleasing to find an obvious problem that would be easy to resolve. We were pleased that we couldn’t see any evidence of water ingress between the layers of material in the roof, the recent dry weather had done it’s job. The hard work for Paul was cleaning the roof of all the old sealant so that he could re-seal with confidence. Some gentle scraping with a super sharp scraper and a bit of final cleaning left that section of roof brighter and whiter than the rest. 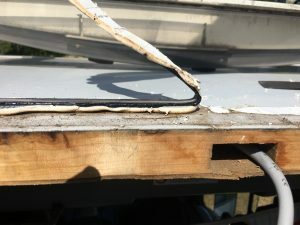 We re-sealed with Skiaflex 221 as recommended by our local motorhome repair shop; it remains permanently elastic so allows for the movement of the roof, something that is particularly important to us as we keep the kayak on the roof and getting it off and on definitely creates a bit of flex. If you read up on-line there is a lot of disagreement as to the best sealant to use, but there are two things everyone agrees on; don’t use a setting adhesive and don’t use silicone. The prolonged spell of hot dry weather meant that we didn’t see the results until two weeks later. Happily we can report that the we had no water ingress during the thunderstorms that hit the country last weekend.